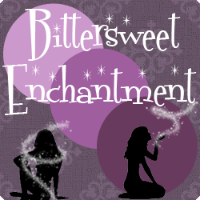 Bittersweet Enchantment: Book Spotlight: A CURIOUS BEGINNING by Deanna Raybourn + Giveaway! 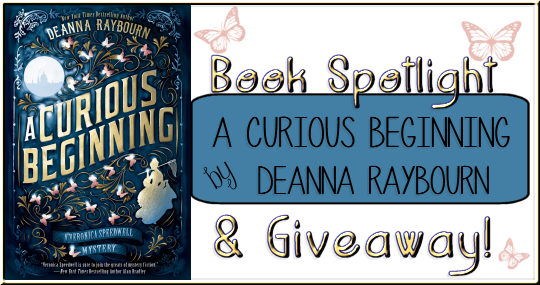 Book Spotlight: A CURIOUS BEGINNING by Deanna Raybourn + Giveaway! 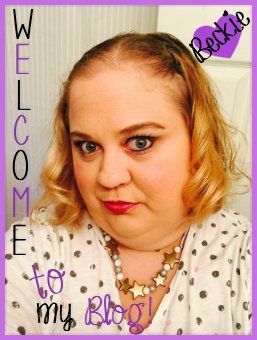 Hello and welcome to the book spotlight and giveaway for A CURIOUS BEGINNING by Deanna Raybourn! 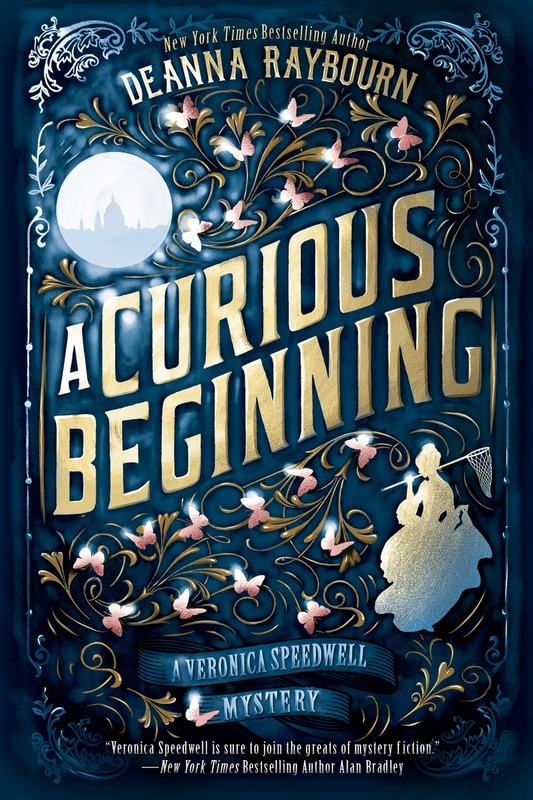 To celebrate the new paperback reprint cover Berkley publishing has asked me to share the new cover and all about the book. 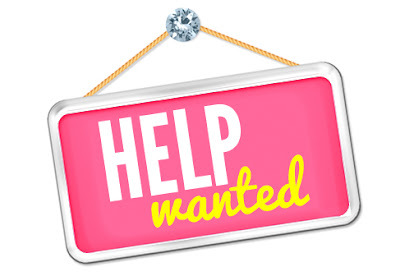 There is also giveaway below for a copy of the book! Enjoy! I stared down into the open grave and wished that I could summon a tear. Violent weeping would have been in exceedingly poor taste, but Miss Nell Harbottle had been my guardian for the whole of my life, and a tear or two would have been a nice gesture of respect. The vicar murmured the appropriate prayers, his voice pleasantly mellow, his tongue catching softly on each s. It was the first time I had noticed the lisp, and I only hoped Aunt Nell would not mind. She had been quite exacting about some things, and elocution was one of them. I slipped my dry handkerchief into my pocket with a sigh. Aunt Nell’s death had been neither sudden nor unexpected, and the warmth of our affection had been tepid at best. That her death removed my last attachment to childhood did not unduly alarm me as I stood in the quiet churchyard of Little Byfield. In fact, I was aware of a somewhat disconcerting feeling of euphoria rising within me. As if to match my mood, the breeze rose a little, and on it fluttered a pair of pale wings edged and spotted with black. “Pieris brassicae,” I murmured to myself. A Large Garden White butterfly, common as grass, but pretty nonetheless. She darted off in search of an early cabbage or perhaps a tasty nasturtium, free as the wind itself. I knew precisely how she felt. Aunt Nell had been the final knotted obligation tying me to England, and I was unfettered once and for all, able to make my way in the world as I chose. The vicar concluded his prayers and gestured to me. I stepped forward, gathering a clump of earth into my gloved palm. It was good earth, rich and dark and crumbling. “Rather a waste,” I murmured. “It would make for an excellent garden.” But of course it was a garden, I realized as my gaze swept over the gravestones arranged in neatly serried rows—a garden of the dead, the inhabitants planted to slumber peacefully until they were called to rise by the trumpet of the Lord. Or so the vicar promised them. It seemed a singularly messy undertaking to me. To begin with, wouldn’t the newly risen be frightfully loamy? Shaking off the fanciful thought, I stepped forward and dropped the earth. It struck the lid of the coffin with a hollow thud of finality, and I brushed off my gloves. I had small wish to take tea with the vicar and his dull wife, but accepting was easier than thinking of a reason to refuse. The vicar led me through the lych-gate and onto the path that led to the great, shambling rectory. He was burbling on like a talkative brook, no doubt reciting from a lesson he had been taught in seminary—“Comforting Thoughts for the Newly Bereaved,” perhaps. I gave him a polite half smile to indicate I was listening and carried on with my thoughts. Whatever they might have been, they were diverted instantly by the curious sensation that we were being watched. I turned to look behind and saw a figure at the lych-gate, tall and beautifully erect, with the sort of posture a gentleman acquires through either generations of aristocratic breeding or enthusiastic beatings at excellent schools. There was something foreign about his mustaches, for they were exuberant, long and sharply waxed into elegant loops, and even at a distance I could detect the slender slashes of old scars upon his left cheek. A German, then, I decided. Or perhaps Austrian. Such scars were unique to the Teutons and their bloodthirsty habit of marking each other with saber tips for sport. But what business did a Continental aristocrat have that required him to lurk near the graveyard of so nondescript a village as Little Byfield? I turned to put the question to the vicar, but as I did, I saw a flicker of movement and realized our visitor had slipped away. I thought no more about him, and in a very short time I was seated in the stuffy drawing room of the vicarage, holding a cup of tea and a plate of sandwiches. With the effort of packing up the cottage, I had not always remembered to eat in the hours following Aunt Nell’s death. I diligently applied myself to two plates of sandwiches and one of cake, for the vicarage employed an excellent cook. I did not reply. My mouth was full of Victoria sponge, but even if it had not been, there seemed no polite response. The vicar and his wife exchanged glances, significant ones, and the vicar cleared his throat. “Should I not?” I asked as politely as I could manage. Yay, time for the giveaway! The wonderful people at Berkley Publishing Group are giving me a print copy of the book to give away on my blog! Open to US residents only. I like it a lot! Love the butterflies and the net in her hand. I love the cover!!! So nice.